How do I Choose the Best Exercises for Sciatica? Physical therapy can help relieve pressure on the sciatic nerve. The sciatic nerve originates in the lumbar and sacral spine. Numbness in the foot is a common sign of sciatic nerve compression. Sciatic pain may be experienced at the back of the legs. Lower back stretches may be helpful in treating sciatica. Sciatica is the name for the symptoms of numbness, tingling, and pain that result from compression of the sciatic nerve. There are two ways in which this compression typically occurs. 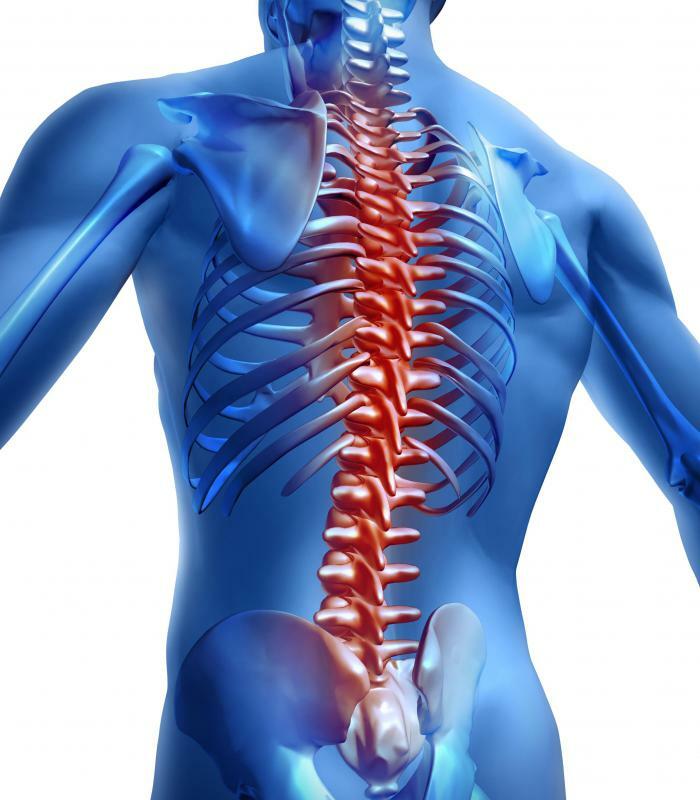 Injury to a structure in the spine such as a slipped or bulging disk can pinch the roots of the nerve in the spinal column, or an overly tight piriformis muscle in the hip can compress the nerve. When a spinal injury is not suspected, the latter condition, known as piriformis syndrome, is the most common explanation. Piriformis syndrome can be corrected with a few simple exercises for sciatica, including stretches for the piriformis muscle and strengthening moves for the weaker glute and core muscles around it. Originating in the lumbar and sacral spine, the sciatic nerve, which serves the entire lower body, runs under the piriformis muscle and in some cases runs right through it. This muscle is found under the gluteus maximus, the large muscle in the buttocks. It works to rotate the hip, or turn the toes out. When a person is inactive or sits for extended periods of time, the piriformis can become tight. When this occurs, the shortened muscle can spasm and compress the sciatic nerve, resulting in the shooting pain, tingling, and numbness down the back of the thigh that is associated with this condition. Focusing on getting the piriformis to relax and return to its normal length, therefore releasing pressure on the sciatic nerve, is the goal to keep in mind when beginning a regimen of exercises for sciatica. To treat these symptoms, several exercises for sciatica that address both the tight and weak muscles in the region are recommended. First and foremost, experts suggest stretching the piriformis every day and whenever symptoms arise. To stretch this muscle, those suffering from sciatica can practice a seated version of what is known as the figure four stretch. To do a correct figure four stretch, you should sit up straight on the edge of a chair. The right ankle should be crossed over the left knee, and the left foot placed firmly on the floor, with the right knee angled out. Next, lean forward with a straight back until the stretch is felt deep in the right hip, holding this position for 20 to 30 seconds, and then repeat on the opposite side. Sedentary individuals may also develop weak glutes. The piriformis, along with the lower back muscles, hamstrings, and hip adductors in the inner thigh, will become overactive during movement to compensate for the work not being done by the glutes. Therefore, it is important to incorporate the gluteal muscles into a regimen of exercises for sciatica. To help strengthen the gluteal muscles, which extend the hip joint and work to raise the leg to the side, resistance-band walking is one recommended exercise. A resistance band, which can be found at most fitness retailers, should be slipped around both legs just above the knee joint. With the legs straight and glutes engaged, take small lateral steps across the room, taking care to keep toes pointed forward, and aiming for at least 20 steps in each direction. In addition, core-strengthening exercises for sciatica in a training routine are often advised. This can help to maintain the alignment and function of the lumbo-pelvic complex, which encompasses all the muscles around the lumbar spine as well as those of the hips. One exercise that strengthens these muscles concurrently is the reverse hyperextension. To perform this move, one should lie face-down on a flat bench with the hips and legs just off the end of the bench and knees on the floor. Keeping the abdominals drawn in and hanging onto the bench with both hands above the head, she should then squeeze the glutes and extend the legs straight back until they are parallel with the torso, pausing at the top and returning to the start position for a total of ten to 15 repetitions. What Are the Different Types of Hyperextension Exercises? What are the Different Types of Piriformis Syndrome Exercises? What is the Best Piriformis Syndrome Treatment? What are Common Causes of Left Leg Weakness?